The leading software developer will exhibit its fully integrated concept-to-consumer solutions in Booth #3954 and discuss industry best practices for Omnichannel Order Fulfillment in the Technology Solutions Theater. Companies now have the opportunity to trade the complexities of running multiple, customized systems for a simpler, single solution approach that gives them the visibility and efficiency they need to succeed in a rapidly changing industry. Simparel, Inc. (http://www.simparel.com), a leading developer and marketer of Simparel® concept-to-consumer software solutions for apparel and softgoods retailers, top tier brands and manufacturers, announces its participation in the Technology Solutions Pavilion at the Texprocess Americas trade show on May 13-15 in Atlanta, Georgia. In Booth #3954 of the industry’s largest North American tradeshow, the company will demonstrate the latest in Enterprise Resource Planning (ERP), Product Lifecycle (PLM), Supply Chain (SCM), Warehouse Management (WMS) and other fully integrated business solutions. Also at the event, Simparel Chief Operating Officer Roberto Mangual will discuss the challenges and industry best practices related to “Omnichannel Order Fulfillment” in a 30-minute presentation on Wednesday, May 14 at 11:15 AM (EDT) in the Technology Solutions Theater. In contrast to traditional and single-purpose software solutions that require complex customization and integration, Simparel is an industry-focused enterprise solution that manages the entire business and supply chain by incorporating key operational software capabilities into a single IT platform. Designed specifically for the apparel, footwear, accessories, home furnishings and other softgoods industries, Simparel empowers retailers, brands and manufacturers to reach their full potential by accelerating and improving performance across the entire business and global supply chain. 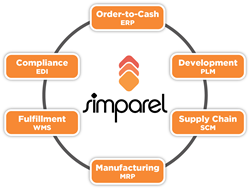 The Simparel Enterprise Solution provides global process visibility, control and collaboration by combining traditionally independent Product Lifecycle Management (PLM), Sourcing & Supply Chain Management (SCM), Manufacturing Resource Planning (MRP), Electronic Data Interchange (EDI), Warehouse Management (WMS) and other productivity tools into a single fashion-focused business system. The fully integrated end-to-end functionality of Simparel keeps teams and vendors working on the same page and drives more-timely, better informed decision making across the business. The next-generation Simparel software architecture is simpler to deploy and offers a magnitude of scalability, performance and speed to benefit traditional enterprise solutions. At a lower total cost of ownership to competing solutions, clients routinely report increased agility, flexibility, responsiveness and faster, more efficient product development, sourcing, manufacturing, customer deliveries, inventory and cost controls all made possible by Simparel. For more information, visit http://www.simparel.com.